In general, oil palm plantations are created after clear-cutting over a wide range of existing forest including secondary forest and rubber gardens. The clear-cutting process often extends to land that is over a few thousands and tens of thousands of hectares followed by the planting of new palms. This drastic change of landscape has drawn people’s attention and often they imply that this land use is the source of problems such as destruction of the natural ecology, soil loss, and river contamination triggered by the heavy use of herbicides and fertilizers. This situation, however, has changed recently in Sarawak. A few companies have obtained RSPO (Roundtable for Sustainable Palm Oil) certification while in some areas local people have begun to plant oil palms for their own personal gain. This change in the social situation of oil palm production is patently obvious in the numbers presented in Fig.1. The expansion of oil palm plantation by the mid-2000s was under the initiative of private companies while the rapid growth of recent years implies smallholders have been embarking on the production of oil palm. There are insufficient reports on oil palm production by smallholders in Sarawak and it is difficult to know the true situation in this area. This is the first report of our pilot study on oil palm management by smallholders that we conducted in the longhouses around the Tubau area in August 2011. We made several visits to Sarawak over a long period of time and as recently as 5 or 6 years ago we felt that the impact of oil palm production on the local communities was negative. A handful of villagers started to grow oil palm seedlings in the early 2000s without practical knowledge and back then, there was no guarantee that they could sell their fresh fruit bunches (FFB) to the local oil mills. Things have changed in the past couple of years. Today, oil palm agriculture prevails among the local communities in rural areas where road connections have been established, and people flock to the oil palm market. This sudden boom in the oil palm economy was clearly evident when we visited the oil mill of Company K, one of the oil palm plantation companies. We observed a busy stream of lorries and pickup trucks, fully loaded with FFB from neighboring longhouses. We even saw passenger cars piling up FFB in the backseat (Photo1). By observing these situations, many questions arose. How do they grow oil palm until it is ready to harvest? What kind of systems and infrastructures do they have to harvest the FFB and to transport it to the mills? Above all, does oil palm production really pay off? We discovered that our knowledge of the oil palm business here was severely lacking to answer these basic questions. There were some differences among the longhouses we visited regarding the timing of the introduction of oil palm, the size of the planting area, transport systems and the mills they sell to. Here we present the distinctive trends of oil palm production of each longhouse. The people of this longhouse started to grow oil palm about 8 years ago. At that time Company K gave away the oil palm seedlings to them. The volume of oil palm seedlings planted by each household varied but it was approximately 500-1000. The village headman planted 700 seedlings at first and increased the number with time and now it has reached about 2,000. For the last couple of years, many villagers have started planting oil palm seeds purchased from MPOB :Malaysian Palm Oil Board and transplant the seedlings by themselves (Photo2). Now all the households plant oil palms. The oil palm fruit produced by the villagers is sold to Company K’s oil mill. The villagers, like the headman who has 2,000 oil palms, usually harvest FFB twice a month. Each harvest produces around 6 tons, so the total monthly production is approximately 12 tons. The maximum loading capacity of a lorry is about 3 tons, so they usually transport FFB twice (approximately a one-hour drive) for each harvest to the oil mill. Daily workers are employed periodically, and even workers from outside of the village are recruited. In some cases, several households harvest together, practicing labour exchange (bedurok). In this village, there are six lorry owners and they use their vehicles to transport their harvest as necessary a couple of times a month. In their down time, they provide a transport service to other villagers who don’t have any means of transportation. The transportation fee is MYR 30 per ton, but an additional MYR 20 is required to hire a driver . Almost all households can produce FFB now and all of the harvests are brought to Company K’s mill. However, a new oil mill of SOP (Sarawak Oil Palms) is being built in the vicinity of the village and once the new plant begins its operation the villagers will have the option to sell their FFB to it. Unlike other longhouses, Rumah M has a close relationship with Company K. The company offers the villagers of the longhouse a 10-unit training workshop as a group scheme program. Prior to this workshop, the villagers had already taken the RSPO certification program and they obtained smallholder certificates from RSPO. All households took part in the training workshop and showed their enthusiasm for oil palm production. They proudly showed off their certificates to us. This Iban longhouse is also near Company K’s plantation site but their oil palm production is relatively slow, compared to Rumah M; most of them started just 4-5 years ago. Many of the villagers purchase the seedlings from a nursery along the Miri-Bintulu road. 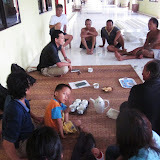 The headman told us that he had never grown oil palm from seed. In this village, some of the households had their first harvest last year. Mr. A, the headman of the village has 2,000 oil palms and just like the headman Mr. M, Mr. A’s monthly harvest reaches around 12 ton. The volume of oil palms possessed by each household varies from a few hundred to six-seven hundred. What is certain is that all households in this village grow oil palms today. What impressed us was that if they can manage to produce a few tons of FFB a month, it will be sufficient for them to make a living solely from oil palm production. There is only one lorry in this village but the villagers manage to transport all the FFB as the volume of the harvests is relatively low at this stage. In this village, only four people have a vendor license to sell FFB, but other villagers can sell their FFB using the headman’s license and lorry. They pay the same transportation fee as Rumah M, MYR 30 per tons. Company K has planted oil palms in the territory of this village but it is not an issue at the moment. The company pays MYR 700 in compensation per 1 hectare of their land to control the complaints of the villagers. The situation is the same as Rumah M.
Like Rumah M, Rumah A is located in the vicinity of Company K’s plantation area but the village has not received as much support as Rumah M. The village started planting oil palm slowly so the volume of the harvest is still small. Most of them have purchased seedlings from other vendors. All this indicates that the company’s approach to the local communities is inconsistent. To the best of our knowledge, the company’s community support activity seems concentrated on Rumah M.
Rumah N is located along Bakun Road. This Iban village began to plant oil palm relatively earlier than others villages. The villagers started planting oil palms around the same time as Rumah M did in 2003 or 2004. As in other longhouses, not all of the households started planting at the same time. Some villagers are still waiting for their first harvest while most villagers already own 300 to 1,000 oil palms. The headman has 700 oil palms and 500 of them have already matured. Each household purchases their seedlings from their own suppliers. They usually purchase seedlings from a nursery and seeds from the Department of Agriculture. They can sell their FFB to any mill, but many of them now sell their FFB to Company K since its oil mill began its operation by taking account of the distance from the village and its buying price. The headman sells his harvest twice a month at 3-6 tons each. Only the headman owns a lorry to transport FFB in this village. Ishikawa, Hoshikawa and Soda visited the village in August 2008 and the lorry was delivered to the headman on that day coincidentally. He had hoped to make some money by providing an FFB haulage service to the villagers. But his new business fell short of expectations because most villagers began to transport their FFB by themselves. Aside from the headman, the harvest amounts of the villagers are still small so they can transport their harvest with their Hilux or other compact cars. Only a few cars were there when we visited in 2008 but today the number of cars has increased to 9 which indicates the booming economy of the oil palm business. A family that doesn’t have a car can ask their son in Bintulu to come and transport their FFB. The implication here is that the longhouse is based on individualistic smallholder management. The villagers started oil palm production 4-5 years ago. According to the villagers, most Kayan longhouses around this area have already planted their oil palms. In Rumah W, however, not many households have their harvests yet. Only a Penghulu and 5-6 other households have begun to sell their FFB from the last year. Most of them preferred to buy seedlings from a Chinese nursery than to sow the seeds by themselves. The farmers who don’t have any means of transport borrow a vehicle when they need to transport FFB. There are 4 Hilux (maximum loading capacity: 700kg) in the village and it usually takes MYR 80 to borrow a car to make the round trip to Company K’s mill. The transportation fee of the car seems rather expensive compared to the transport cost in Rumah M or Rumah A (MYR 30 per ton) but this is because Rumah W is much further away from the mill (a round trip of approx. 15km) than Rumah M and Rumah A. Some villagers ask their Chinese son-in-laws to use the lorry. The surge in oil palm production reached this village only recently. A young man said that he would return to the village in the near future. He has a steady job in a logging company but he thinks the areas around the village will become oil palm plantation zones in five years and he will quit his job and return to the village to engage in oil palm production once he has planted enough oil palms to make a living. One thing that impressed us at Rumah W is that Penghulu’s brother was planning to turn his land of 100 hectares into an oil palm plot. During our stay we saw about 5 hectares of reclaimed land in which the seedlings of oil palms were planted. He plans to take out a loan of a few million Ringgit from AgroBank. He has already borrowed about MYR 60,000 and is complaining about the hike in the price of fertilizers. The designated land of 100 hectares is comprised of the land of Penghulu’s father as well as other villagers’ land. The land reclamation will be conducted mainly on the secondary forest, excluding rubber gardens. Workers are employed for clear cut logging and land-clearing while constructors take on road creation and terrace building with heavy machinery. As one example, it takes MYR 1,000 a day for the construction of a terrace by renting a digger although the actual payment depends on the workload. This investment and development plan may seem somewhat beyond the capacity of smallholders. This grand vision of investment and development is only feasible for them because Kayan society has a class system or hierarchy, and some of the villagers are very wealthy. In this regard, the situation of this village may progress very differently from smallholders’ oil palm production of neighboring Iban communities. This is a brief summary of our interview researches at four longhouses. As we were limited as to the time we could spend in the village, only simple interviews and observations were possible. But we believe it was a valuable opportunity to grasp the big picture of the wide variations in oil palm production by smallholders. Many smallholders or their family members have work experience in plantation companies or have connections in the companies. Most of them start their production by following someone’s example and learn planting methods and knowledge indirectly. Many of them follow the companies’ recommended fertilization method or plant spacing but also use their own methods. It seems fair to say that many people in this area are improving economically by producing oil palm and they have high expectations for future success. The purchase price of FFB during our research period was MYR 630/ton (Grade A. In the case of producers who own 2,000 oil palms and have 12 tons of monthly yield, like the headmen of Rumah M and Rumah A, they roughly earn MYR 7,500 a month. This is more than we estimated even after setting off the various costs of seeds and seedlings, fertilizers, agrochemicals, gas, and wages for workers. If they have their own land and a sufficient labor force (including employed workers), oil palm production could be a lucrative economic activity. According to Mr. L and Mr. N, the timing and choice of oil mills to sell their harvests to are very important to make good money. Some mills pay in cash while others pay by crediting the amount into the bank account later and the price differs in each mill. Furthermore, the distribution channel from the farm land to oil mill is surprisingly complex. Some mills are eager to purchase FFB directly from smallholders while there are brokers involved in the route of circulation between the smallholder and the mills. Although we don’t mention the former agricultural crops such as rice, rubber and pepper in this article, further research is necessary in this area to determine the change in attitudes among the people to the subsistence activities. At this stage, oil palm production varies with the longhouses and each individual. This entry was posted in Report of Research and tagged Center for Southeast Asia Studies, longhouse @en, Malaysian Palm Oil Board, oil palm, oil palm plantation, Ryoji Soda, Sarawak @en, Sarawak Planted Forest, Yumi Kato. Bookmark the permalink.